The United Nations and a coalition of partners today launched a comprehensive approach to fighting malaria, a disease which – despite tremendous advances – still kills an estimated 660,000 people each year and poses a major challenge to development. With the participation of world leaders gathered in New York for the 68th General Assembly, the Roll Back Malaria Partnership (RBM) and the UN Development Programme (UNDP) launched the Multisectoral Action Framework for Malaria, which calls for greater coordinated action among different development sectors to tackle the disease, which exacts its deadliest toll in sub-Saharan Africa. The Framework identifies actions to address the social and environmental determinants of malaria, and calls for current malaria strategies to be complemented by a broader development approach, according to a UNDP news release. “Malaria is a disease associated with lack of socio-economic development, poverty, marginalization and exploitation. Each of these dimensions has roots beyond the health sector – so a multi-sectoral response is essential if we are to free the world from the burden of malaria,” said Rebeca Grynspan, UNDP Associate Administrator. According to UNDP, stronger global health partnerships and greater funding in recent years have already resulted in unprecedented progress, with a 25 per cent decrease in global malaria deaths. Forty-three countries have seen malaria cases decrease by more than 50 per cent. Factors that increase vulnerability to malaria infection, however, often lie outside the health sector, involving housing, education, urban planning, agriculture, transportation and other areas, UNDP said. For that reason, the RBM coalition and UNDP conducted consultations among more than 70 experts from a variety of sectors to develop an operational roadmap for identifying key steps, expected outcomes, and capacities needed to integrate malaria control into broader development processes. “The Multisectoral Action Framework for Malaria will guide the global response to malaria in coming years as we develop the next phase of the Global Malaria Action Plan as well as the post-2015 agenda,” said Fatoumata Nafo-Traoré, Executive Director of the Roll Back Malaria Partnership. Targeted by the current development framework, the Millennium Development Goals and identified by UN Secretary-General Ban Ki-moon as a top priority under his second mandate, malaria affects all aspects of development, costing Africa alone some $12 billion in lost productivity each year, according to UNDP. 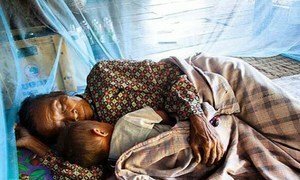 With a $15 billion investment over the next three years, the global community can make huge strides towards defeating HIV/AIDS, tuberculosis and malaria – saving both missions of dollars and millions of lives, according to a new report by the United Nations-backed fund to fight the pandemics.